Newcastle United’s Nigerian forward Shola Ameobi has sent messages of support to communities in Nigeria’s Ogoni land, whose lives and livelihoods are being dramatically affected by the effects of years of oil spills. In 2011, the BCC reported that some local communities were drinking from wells containing levels of benzene, a known carcinogen, at 900 times recommended levels. Show Racism the Red Card was asked by UNISON and War on Want to help facilitate a meeting between Shola, who is a patron and long term supporter of the anti-racism campaign, and Nigerian human rights NGO Social Action. During a meeting at Newcastle United’s training ground last week, Celestine Akpobari of Nigerian human rights NGO Social Action told Shola about the situation of the Ogoni people in the Niger Delta, and Shola threw his weight behind the campaign to force Shell to clean up the devastation which they have caused to the Ogoni environment. The United Nations Environmental Programme has said that it will take 35 years to clean up the Ogoni land and water systems, and that Shell should pay $1 billion dollars just to begin the process. 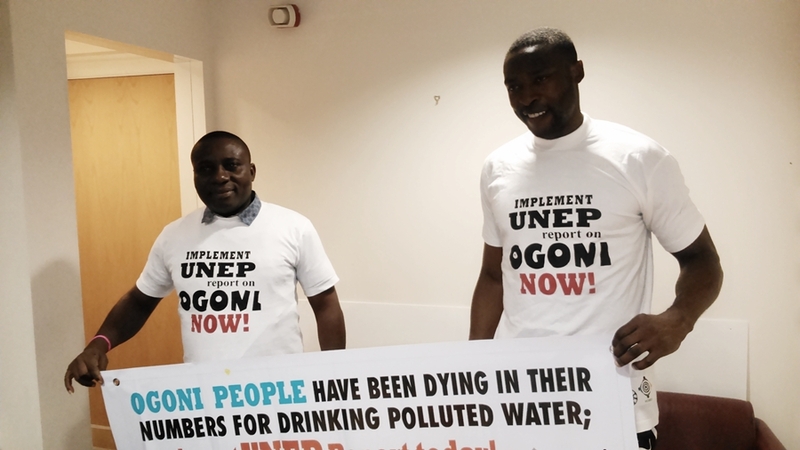 You can read more about the Ogoni land crisis via this report from the United Nations Environmental Programme.